snspt027 - Is your original Super Nintendo Entertainment System (SNES) controller just not performing as it once did? Are your controller buttons sticking? Do you have to push hard on them to get them to respond? The rubber pads within your SNES controller has contacts that wear out over time and are the leading cause of interment response, poor range of motion, delayed reactions, sticky controls and mushy or flat-lined buttons. This SNES controller repair kit is exactly what you need. You can breathe new life into your badly functioning SNES controllers with this total SNES controller repair kit. If you are like me, and loathe those cheaply made 3rd party new controllers, and your once classic Super NES controller is worn and flat lined, this is the kit for you. 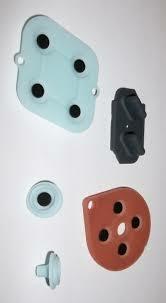 These parts have been manufactured to the highest standard and quality. They are made to be used only in the OEM SNES controller model SNS-005 [OEM SNES controller]. They will correct the control problems and also fix that "non-firm feel" that your original SNES controllers get over time. These parts look, feel and fit perfectly into your Original SNES controller to make it perform and feel like it did when you first bought it. Kit contains detailed instructions, five SNES controller contact pads, one for the A, B, X Y buttons, one for the directional control, two for the Left and Right buttons and one for the start and select buttons. The repair only takes a few minutes and requires only a small screwdriver and solf cloth. Includes maintenence tips and instructions to repair one original Super Nintendo Entertainment System / SNES controller.